Houzz 384 of our visitors have told a friend about this plan. 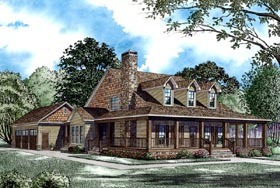 This beautiful country home offers a huge wrap-around front porch and has a side loading 3-car garage. A derivative of plan 62032, the great room has a fireplace and is open to the kitchen. The kitchen features a large island bar, a walk-in pantry, breakfast nook, dining room and access to the grilling porch. The laundry room has a shower and toilet for more convenience. The master suite has 2 walk-in closets, and the master bathroom offers a corner whirlpool tub and a corner glass shower. 3 more bedrooms are located in the back corner of the house, and the upstairs is an enormous game room. Question: In the Great room do the measurements include the width of the staircase or not? It would be 15 feet plus the stairs or 15 feet with the stairs so the room would be about 12 feet something wide. Answer: The stairs are not included in the great room measurements. The width of the stairs is 3’-6”. Answer: To remove the garage from the plans and remove the upper level would be a modification. Question: Hi. What type of ceiling does the living room have in this plan? Cathedral? Vaulted? It does not show on the plan. Thank you! Question: if we don't opt for the bonus room, is this space intended to be an attic? if so, does this change the design of the dormer windows (i.e. do you remove the windows). also, is the stair replaced with a drop down attic stairs? Answer: These are all things that can be determined on site with the builder if they choose not to finish the bonus room. However, they may want to consider leaving the stairs and windows in case they want to finish it in the future. Question: 1.What are the ceiling heights of the the home plan? or is it all 9 feet tall all around the house? 2. will the plans include roof building plan other than birds view? Answer: 9ft ceiling height main floor and 8Ft for bonus. Also, on this plan it comes with bird eye view and roof framing details. Question: Is it possible to preview the crawlspace option for this plan? Answer: I’m sorry but we cannot send a foundation plan prior to purchase. Answer: This would have to be determined by doing a modification to the plan, since there is no current vault. Question: what is the size of the closet in the mudroom off the garage? Question: Hi what’s the total square feet with the game room? I thought the total sq feet with second floor was 2180? But builder says no. I’m thinking of buying this floor plan I love it. Answer: Main Floor: 2180 Sq.Ft. Porch : 898 Sq.Ft. Garage: 979 Sq.Ft. Bonus Room: 1.214 Sq.Ft. Total Square Feet: 5,271 Above is the square footage breakdown. Question: Does plan 62207 meet the 2015 International Residential Code? I have heard that 2015 IRC requires 2x6 walls, but I do not see an option for 2x6 walls in Available Exterior Wall Types. Answer: We include the 2015 IRC’s and we can make the exterior walls 2x6 for a $250 fee. Question: How big is the pantry? Also, is the kitchen open to the livi g room? Question: What is the ceiling height in the living room area? Answer: The bonus room on this plan is easily eliminated on site by the builder to give a single story plan. Thanks! Question: If we opt to not go with the upstairs space, therefor removing the staircase, does that mean we will not have the windows upstairs? We really like the look of them but do not want to keep the staircase. We would like to keep the roof as is with the windows, so would we still have a way to access to clean them? Lastly, what would be the sq ft for the great rm with the staircase removed? Thank you! Answer: If you eliminate the stairs nothing else will change. you can access the upper “attic space’ by using a heavy duty Pulldown attic stair system; place in a hallway leading to the other bedrooms. Thanks SO MUCH for your inquiry! Question: With the basement foundation type where are the stairs located? Answer: Thank you for your interest in our home plan design. The basement stair is located under the bonus room stair. An access door will be at the rear of stair location on main level for bonus. Question: What would the sq.ft be with only a 1 or 2 car garage? The unheated garage space sq ft is figured width times depth. Answer: Thank you for your interest in our home plan design. Although this is one of our best selling plans, currently we do no have any photos available as we are requesting photos from customers and hope to have results soon. Question: Can this be done without the upstairs? If so, what would the square footage be of the house without the upstairs? Answer: Thank you for your interest in our home plan design. The bonus space upstairs is optional space and therefore is not in the total living sq ft. The stair location would only remove 40 sq ft from the total living space (3052 sq ft); however, the sq ft of stairs will remain if the storage is kept on the plan. The stair location and bonus space can be eliminated from actual build of home plan, however the stair sq ft will either be place in the laundry/storage area or become part of the garage sq ft (not h/c) if storage is kept as well. Optional bonus sq ft is 626 sq ft which if plan to build will increase total living to 3678 sq ft.